Happy October! I hope the weather is as nice where you are as it is here. Don't you just love Fall? 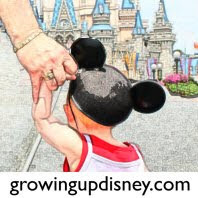 Miss anything on Growing Up Disney this week? Here's what's been going on. Mommy Monday: Amy reviewed a custom camera strap cover. We're giving one away so enter by Monday night. Photo Flashback: DisneyDad shared a photo of him and Amy in 1979. Check out the ticket being tested at the time. Guest Post: Corby recalled a trip that was almost rained out and passes on her lessons learned. A Walk Around The World with Ridge: Chris discussed his thoughts on Walt Disney World as a big & tall man. Thanks for joining us! Have a wonderful weekend!